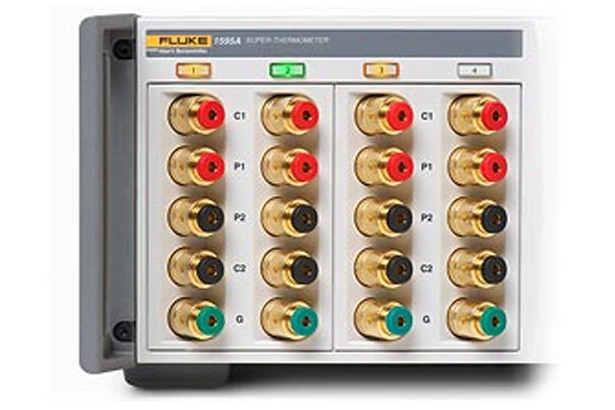 The Fluke Calibration 1594A and 1595A Super-Thermometers combine the accuracy of complex and expensive bridges with innovative features that simplify measurement processes and provide excellent value. They are accurate enough for the primary lab and economical enough for the secondary lab. With temperature-controlled internal reference resistors, six input channels, a large graphical display, and a multitude of temperature-specific measurement functions, PRT, thermistor and SPRT calibration (0 Ω to 500 kΩ) has never been so easy and economical. And with the built-in Ratio Self-Calibration function, you can verify or calibrate the Super-Thermometer’s ratio accuracy in-house with the press of a button—no other single thermometry bridge can do so much, so well! When your goal is to achieve the highest measurement accuracy possible, you will mostly likely make a resistance ratio measurement (Rx/Rs). The measurement accuracy of the 1595A over typical thermometry ratios (0.25 to 4.0) is as good as or better than 0.2 ppm. And for ratios near unity (0.95 to 1.05), the resistance ratio accuracy of the 1595A is as good as 0.06 ppm. You get the linearity of a traditional resistance bridge with an instrument that is easier to use and a much better value. Example 1: Using a 25 Ω SPRT with a 25 Ω external reference resistor, the resistance ratio uncertainty of the 1595A at the triple-point of water is only 0.06 ppm (Rx/Rs ≈ 1). This becomes significant when considering that the uncertainty of the RTPW measurement is propagated throughout all ITS-90 temperature measurements. Example 2: The Direct Comparison Method measures the probe under test directly against a calibrated reference SPRT by defining the SPRT as the reference resistor (Rs). Since the ratio Rx/Rs ≈ 1 over the full temperature calibration range, the uncertainty contribution of the 1595A to the overall measurement uncertainty is no greater than 0.06 ppm. Considering all other influence effects, total measurement uncertainty can be achieved in the sub-mK range. Although a ratio measurement can produce the most accurate results, it may not always be the most convenient measurement method. Using the temperature-controlled internal reference resistors, the Super-Thermometer can convert an absolute resistance measurement to a temperature unit and display the result in degrees Centigrade, Fahrenheit, or Kelvin, or in Ohms. Each Super-Thermometer includes internal reference resistors of 1 Ω, 10 Ω, 25 Ω, 100 Ω and 10 k Ω that support a variety of PRTs, RTDs and thermistors. How well a thermometry bridge can measure absolute resistance depends on the bridge’s ratio accuracy, as well as the long-term stability and calibration accuracy of its internal reference resistors. 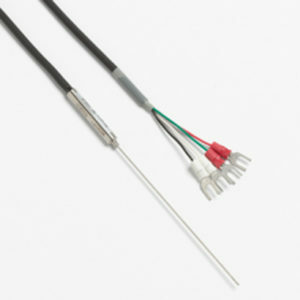 To ensure stability and eliminate errors, the internal reference resistors in the Super-Thermometer are enclosed in an oven that is temperature controlled at 30 °C and stable to within approximately 10 millikelvin. In fact, these precision resistors are controlled so well that within a 24-hour period, their resistance will not change more than 0.25 ppm (equivalent to 0.00006 °C). The one-year absolute accuracy of the Super-Thermometer is 4 ppm (equivalent to 0.001 °C). 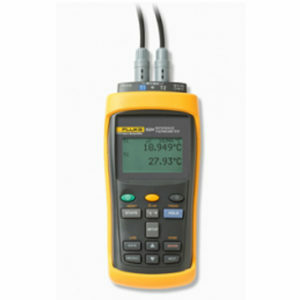 Measurement current accuracy is important when evaluating measurement uncertainty due to self heating of the thermometer. The accuracy of the current source in the Super-Thermometer is 0.2% when measuring 25 Ω or 100 Ω PRTs with a typical sensing current level. 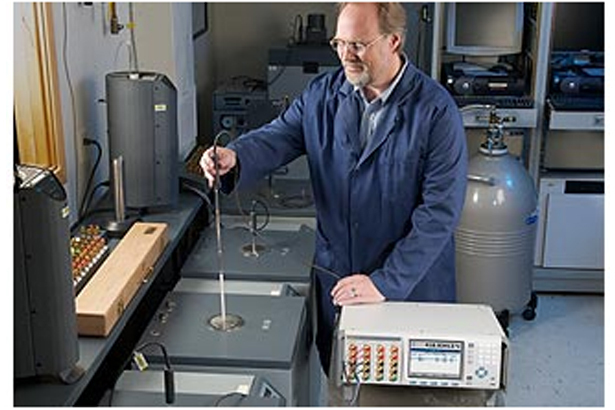 Measurement noise is caused by electrical noise and other random errors that can negatively influence measurement accuracy. New patent-pending design innovations incorporated into the Super-Thermometer reduce measurement noise and interference to levels that are unprecedented for a digital thermometry bridge. Two identical amplifier/ADC blocks measure Rx and Rs simultaneously. Reversing the sensing current and then averaging the two measurements reduce errors caused by thermoelectric EMFs, current source instability, and electrical noise. To further reduce measurement noise, two parallel ADCs are used in each amplifier/ADC block. Passive and active filters are also utilized to reject the majority of electrical noise and interference. In a typical temperature calibration application, the Super-Thermometer offers uncertainty due to measurement noise as low as 0.00002 °C. 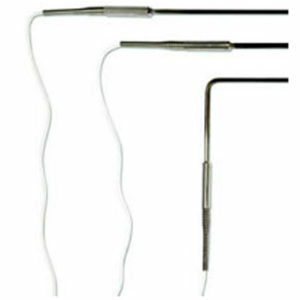 Under similar measurement parameters, the noise level of the Super-Thermometer can be as low as a traditional, much more expensive, resistance bridge. Super-Thermometers offer speeds as fast as one second per measurement (full accuracy with a two second sample rate). You can complete your tests in less time, track temperature changes more accurately, and even evaluate thermal response in sensors. When measuring fixed point temperatures that require the highest levels of accuracy and lowest levels of noise, you have complete control to change the measurement speed to meet your requirements. The 1594A and 1595A feature patent-pending “Ratio Self-Calibration” that enables you to test the accuracy or calibrate the resistance ratio linearity of the Super-Thermometer’s measurement circuit – regularly, easily, and without requiring any external devices or special training. The Super-Thermometer performs the Ratio Self-Calibration by automatically combining and switching between the internal temperature-controlled reference resistors to create a resistance voltage divider network. Replacing RX and RS with the resistance voltage divider allows the Super-Thermometer to complete a series of eight resistance ratio tests, from which linearity errors are calculated and accuracy relative to specifications can be verified. See figures 1 and 2 for examples of the resulting report. Now you can verify accuracy and performance automatically in about thirty minutes, at the touch of a button. Although rare, measurement circuit defects are detected and reported automatically. Through a password-protected procedure, you can choose whether to align the Super-Thermometer by applying the offsets generated by the calibration procedure. No other temperature measurement instrument on the market more fully empowers the metrologist to determine and improve instrument performance. 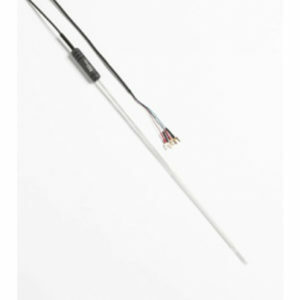 You can also calibrate the Super-Thermometer’s internal reference resistors using the resistance calibration function. This process requires an external standard resistor that is approximately equal in value to the internal reference resistor to be calibrated. The Super-Thermometer assists you with the calibration through an easy-to-use setup utility. Just specify which internal resistor is to be calibrated, the calibrated resistance value of the standard resistor, and the channel to which the standard resistor is connected. The Super-Thermometer configures the sensing current, disables filtering, and sets the timing parameters to the “precision” settings for consistent results. Once the calibration is complete, the Super-Thermometer reports the results to the display and gives you the option to write the results to a USB memory device. You can also choose whether or not to adjust the calibration parameters of the internal reference resistor by pressing the password-protected Adjust Resistor function key. When current is passed through a PRT sensor, power is dissipated by the sensing element, causing the sensor to self-heat. That introduces a small temperature error into the measurement. The error can be estimated by measuring the resistance of the sensor at a given temperature with two different sensing current power levels, nominal current and “double-power” (nominal current ). Through linear extrapolation to “zero-power,” the resistance value of the sensor can then be estimated as if no current were applied to the sensing element. The temperature error due to self-heating can then be effectively eliminated from the measurement. Computing a zero-power measurement manually can be time consuming and subject to calculation errors. The Super-Thermometer’s Zero-Power Measurement function sets current levels and collects measurement data automatically, calculating the zero-power measurement for you. User-adjustable settings give you full control of the process by allowing you to set parameters such as settle time, measure time, and record result. Suppose you want to see the results of more than one channel simultaneously. 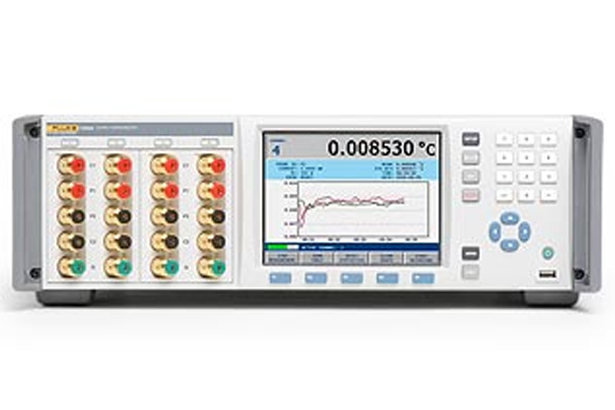 The Super-Thermometer includes two measurement viewing modes—graph and table view modes. Select graph mode to graph a single channel or multiple channels simultaneously; set the duration of the graphing window; select automatic centering or enter a fixed value for the vertical center; select automatic scaling; or enter a fixed value for the vertical span. Configure the graph however you like to fit your application. In table mode, the measured value, mean and standard deviation for all channels are displayed simultaneously in a numeric table format. Simply press the function key to toggle between the graph and table views.